Death Cups combine the strength and taste of the world’s strongest coffee with the convenience of single serve coffee pods to make your morning routine as easy as ever. Each of our K-cup style coffee pods has double the strength of your average cup of coffee, with a smooth, bold taste to give you the morning boost you need. Just pop it into your K-cup compatible coffee maker, fuel up, and go. We have a no BS, risk-free guarantee. If this isn't the boldest, strongest coffee you've had, let us know and we’ll make it right. 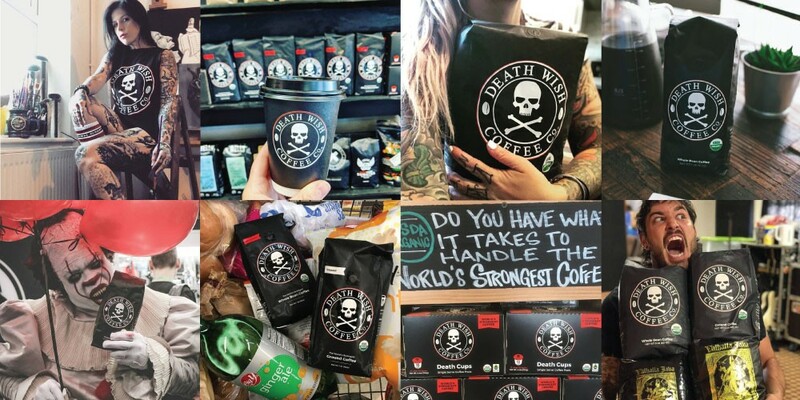 Death Wish Coffee is created with a unique blend of high-quality beans and a roasting process that results in the world’s strongest coffee. Death Wish Coffee is double the strength of your average cup of coffee, with a smooth, bold, never-bitter taste. Our coffee is USDA Certified Organic and Fair Trade. Thousands of people trust Death Wish Coffee to wake them up and keep them going every single day. What are the benefits of a rigid capsule single-serve pods? Death Cups are packed in rigid capsules to give you a bolder, smoother cup from your coffee machine. After months of testing, we found that 95% of Death Wish drinkers preferred the rigid capsules because it produced a stronger, bolder taste. The rigid capsule and lids are recyclable, while the mesh insert and coffee grinds can be added right to your compost pile. What machines are Death Cups compatible with? Our Death Cups are compatible with Keurig 1.0, Keurig 2.0, Breville, Cuisinart, and Mr. Coffee. How many calories are in Death Wish Coffee? What are other nutrition facts? There are two calories in Death Wish Coffee. Because both of our Death Wish and Valhalla blends are USDA Certified Organic and Fair Trade with no additives or ingredients beyond the organic coffee beans, our blend has only about 2 calories per cup, no carbs, protein, or fiber.